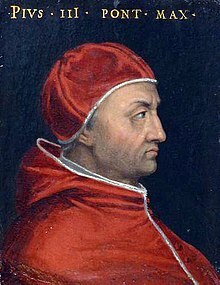 Pope Pius III (29 Mey 1439 – 18 October 1503), born Francesco Todeschini Piccolomini, wis heid o the Catholic Kirk an ruler o the Papal States frae 22 September 1503 tae his daith. He haed ane o the shortest pontificates in papal history. ↑ Hendrix, John, History and Culture in Italy, (University Press of America, 2003), 173. This page wis last eeditit on 5 October 2018, at 03:49.